More than 2,000 delegates from around the world representing governments, civil society, and international organisations gathered from 23 - 27 May 2016 to attend the second UN Environment Assembly, held at UNEP headquarters in Nairobi, Kenya. As the first global meeting since the adoption of the Paris Agreement on climate change, UNEA2 aimed to forward efforts to deliver the environmental dimension of the 2030 agenda. A small team from the BRS Secretariat attended and contributed to numerous Side Events, panel discussions, High-Level forums, Green Room events and throughout the conference throughout the week in order to emphasise the centrality of sustainable management of chemicals and waste to the implementation of the SDGs. An interactive quiz was launched at UNEA2 on this subject to gauge delegates’ appreciation of these linkages and the results will be shared in due course. To take the quiz, please go to the BRS website. Key resolutions adopted by Member States on Friday 27 May included those on the Sound Management of Chemicals and Waste, on Marine Litter, on Sustainable Consumption and Production, on Oceans, and on the role of Multilateral Environmental Agreements, (MEAs). 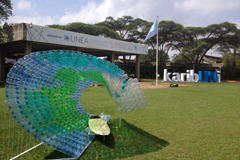 For more information on UNEA2 and on the resolutions agreed, please see the UNEP website.